Okay, it’s not for profit, exactly, though great characters can certainly have a lot to do with whether or not your stories sell. But if you’re not having fun—if you’re not really enjoying the process—what’s the use? I’ve found that the best way for me to get excited—and stay excited—about my stories is to create characters who are realistic and compelling. If my characters bore me, they’ll bore my readers, too. That said, have you ever had a hard time getting a good grasp on your story’s characters? What do you struggle with? Their personalities? Their voices? Their backstories? I used to have a bit of difficulty getting to know the people inhabiting my stories. They all sounded alike, and I found it hard to really connect with them. I didn’t have a clear idea of what made them tick—what made them react and respond the way they did. But that was then, and this is now, and things have changed quite a bit in my relationships with the main populations of my stories. Two or three years ago, a friend of mine began an online journal. This was no ordinary journal, though, as she wrote all of her entries from the point of view of the character in the story she was writing at that time. We began discussing her blog, and she suggested I make a journal for one of my own characters. I did as she suggested, then I had my character friend hers. Before long, our characters were interacting on a regular basis. It was a new experience for me, but I dove right in with a great deal of enthusiasm. I was thrilled at the prospect of getting to know my character better, and I wasn’t disappointed. Through Lucky Raven’s journal, I came up with his backstory, met a few of his siblings, discovered he was only half Cherokee with a father who’d spent time in prison, and learned how he handled love, adversity, and just plain trouble. I began to get a good grasp of his language and personality, and I started to feel as if he were a real, living, breathing young man. The first thing I did was come up with his name. This wasn’t hard. I’d already written a partial story with characters named after two people in my genealogical family tree: John Raven and Mary Stedman. 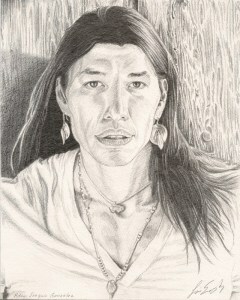 Once I had Lucky’s name, I had to come up with his statistics: Cherokee, 18 years of age), 6’2”, long black hair, etc. I created a character document that told me everything I needed to know about Lucky Raven. If I thought of something later, I’d add it. Then I began to journal as Lucky Raven. It was a bit awkward at first, but I was determined to give Lucky a voice. Unsure about what he wanted to say, I asked him questions. Who was he? What did he want out of life? What were his interests? Before long, he was freely revealing all to me, and I really began to know what made this young man tick. When I write the entries for my characters now, I don’t talk to them. I don’t ask them questions. I let them do the talking. I sit down and imagine that I am channeling my character. He or she is speaking through me, spilling their hearts, their hopes, out onto the page. That doesn’t mean you can’t talk to your own characters in their journals. You can interview them, carry on a casual conversation with them, whatever you want to do. It’s your journal, after all…or rather, it’s their journal, but you get the idea. Depending on the story I’m writing, I may have certain events in mind that I wish my characters to write about—a death, falling in love, reuniting with family or friends. Sometimes I may need to do a little research beforehand, in which case, I look for the information I need, take notes, then write the entry as I keep my notes close at hand for referral. If it wasn’t for my friend encouraging me to create a journal for Lucky Raven, I never would have discovered this interesting, fun technique for getting to know my characters—and I wouldn’t be quite so excited about all the characters who have come after him. If you really want to get to know your characters—get really, really excited about them—start a character journal. It doesn’t have to be public. It doesn’t even have to be online or on the computer. The point is to get to know your character. If you do this, you won’t ever regret it! What a great idea. Most times I conduct interviews with my characters and have a lot of fun answering as them. You can really find out a lot about them when you step in their shoes. Thanks for the great idea. This does seem like a great technique. Like LJ, I’ve sometimes interviewed my characters but never thought of letting them write their own journal. Seems it couldn’t help but draw different stuff out of them, just as it does for me whenever I journal. I love this idea. I have written about using letter-writing as a technique to get into a particular character’s voice for creative non-fiction writing (for example, writing a letter to yourself from “Auntie Em” in her voice) and to help jog memories. This technique is more extensive and would as well for developing (remembering) character in nonfiction (memoir, for example) as fiction. Thanks for the suggestion. I will definitely keep it in mind. I’d never thought of starting a character journal, but it sounds like a very promising idea. A few months ago I stopped working on a novel because the main character was an utter mystery to me. Imagine that. My protagonist, and I couldn’t figure him out. Not good, eh? Now, I really want to get back to that story (it’s based on a real-life conflict in the Middle Ages), just not with a flawed protagonist who happens to be a huge question mark. Maybe his journal will be a good way to flesh him out.